Nothing like turkey and all the fixings plus banchan! I so strongly associate eating turkey with kimchee and rice that even if we have Thanksgiving elsewhere I have to save some turkey to eat with kimchee at home. It doesn't feel complete somehow. Incidentally, my sister who spent the holiday at her just-about-fiance's in Maryland informed me that most of her 'Korean' Korean friends didn't really celebrate Thanksgiving. And if they did they didn't do turkey. Which made me curious as to what was on your table growing up? Did you do turkey or Thanksgiving at all? Looking back I realized that the only reason we celebrated it was because of us kids and we had enough cousin power to insist on having turkey which we probably were roasting ourselves at eleven years old or something. Even now we tend to make all the American dishes while mom slaves over the Korean dishes which always took longer. The interesting thing is that now Thanksgiving has come to mean a doubly huge feast. Mom was on a roll cooking wise and spent the next day making vats of kimchee. 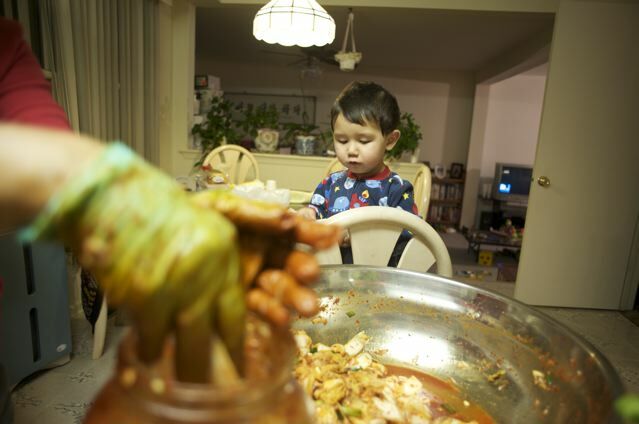 This is my younger son Gabriel watching and what you can't see is he's holding a banchan plate with his third helping of betchoo (cabbage) that's been prepped and just before being mixed with Mom's homemade chili paste. that's it. Not like your mom's turkey AND ham AND mandoo AND pajun AND mashed potatoes and pie AND cookies. that's quite the spread. the following day I had the flu and yesterday I insisted we go to the Korean store and bought lots of kimchi. I'd been eating Indian mango pickle straight from the jar in a pathetic attempt to kimchi-cize. funny how it is the case for almost all koreans i know.. turkey as ban-chan. we've usually gone with chicken, because our family didnt like the taste. do you know how to make kimchee? did you know there is not one kimchee that taste the same? i find that fascinating. TG meal always depended on which house we had it at. 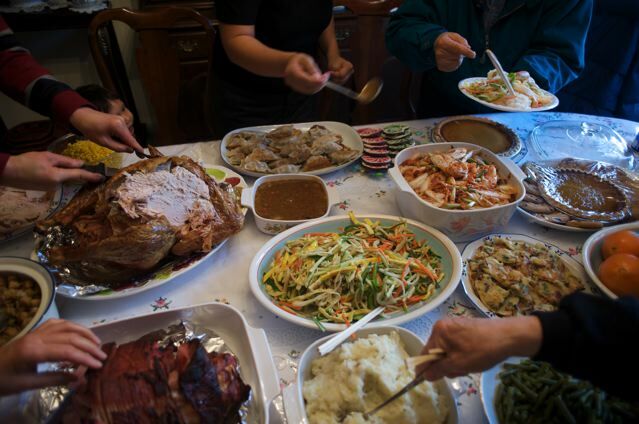 The more Americanized families had more American dishes. But there was always (and still is) always Kimchee and some kind of guk/soup. Staples consisted of: Turkey, gravy, ham or roast beef, mashed potatoes (the real ones! ), stuffing out of the box, brussels sprouts, yams... it looks a lot like Jen's picture, actually, b/c then everyone also brought their own best Korean dishes. And somehow we always had the potato salad with the apples and raisins, and this pasta with lots of ground beef. And also like Jen, it was always the bunch of us cousins who insisted on everything. We always had it at lunch time, and then a second round for dinner.